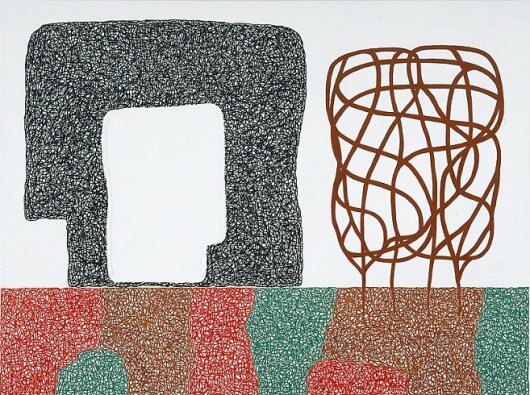 On the occasion of the exhibition Conceptual Abstraction at the Hunter College/Times Square Gallery (through November 10), Mario Naves posts his thoughts on the work of Jonathan Lasker. Naves writes: "Mr. Lasker engages in a purposefully inconclusive dialogue about figure and ground. Bulky, diagrammatic forms—which, at times, achieve a grudging biomorphism—abut or overlay meticulously delineated scrawling. Nothing in the paintings sits quite right. Shapes plop into the compositions (or, rather, anti-compositions) with an oddly satisfying bluntness. Impastoed, superimposed crisscrossing marks are a recurring motif. Thick fields of slathered paint simultaneously open up and congest the canvases. Talk about conundrums: Mr. Lasker’s paintings are clarified and incoherent."